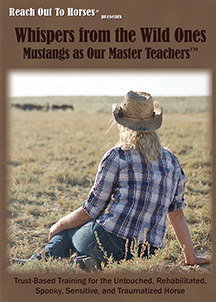 For Immediate Release: Reach Out to Horses® Offers New DVD Release to Mustang Rescues across the U.S.
Reach Out to Horses® has just released the 2-DVD set, Whispers from the Wild Ones: Mustangs as Our Master Teachers. It is the 10th DVD in the ROTH collection of equine instructional programs. During the 176 minutes, viewers will experience not only the majestic mustang in its natural habitat but the exclusive Reach Out to Horses’ highly effective training techniques needed to gentle untouched, traumatized, rehabilitated, sensitive, and fractious horses. Filmed on the iconic lands of Wyoming, Whispers from the Wild Ones walks viewers through the intricate and subtle world of the language of the horse, explaining the crucial differences between mustangs and domestic horses and how, with a true understanding of the language and behavior of the horse, one can create a true, stress-free, trust-based partnership and gentle the wild mustang. • Discover the value of visualization, energetic connection and body language vs. roping, choking and the use of chutes. In addition to the training program, Founder Anna Twinney and ROTH remain committed to ending the captivity and suffering of over 50,000 mustang in BLM holding pens, returning them to their lives on the U.S. public lands, as well as helping those who are unable to return. A simple, cost-effective solution to managing the wild horses is within our reach. It is a strategy that could avoid round-ups, bait-trapping, culling, unnecessary distress, death and family break-ups, and may save millions of tax-payer dollars. It is in that spirit that Anna has decided to create the Donate a DVD program. ROTH with the assistance of many generous donors will be giving away up to 1000 Whispers from the Wild Ones DVD Sets to non-profits and organizations that are committed to the well-being and care of the American Wild Horses and Burros. For more information about the DVD Set, how you can help, obtain a copy for a non-profit or review, contact Vincent at info@reachouttohorses.com.